You got platforming in my…bullet-hell shooter? Yes, it’s real, and Isbarah can show you how great they’ll taste together. Video games are at the point now where we can begin to plunder our own history. Enough genres have existed for enough time with enough established rules that, instead of worrying about defining those rules any further, developers can start to create their own (increasingly goofy) genre mash-ups. These days we’ve got everything from rhythm game/shoot-em-up hybrids to Roguelike platformers, and the still-flourishing indie scene is only helping this trend. 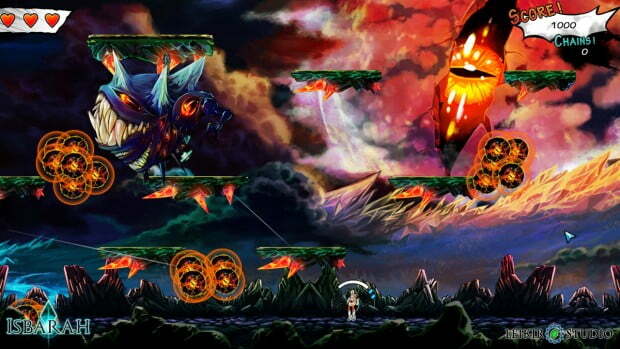 From these creative waters is born the bullet-hell/action/platformer hybrid Isbarah: The First Journey. As you could probably tell from the amount of words needed to describe its gameplay, Isbarah has a lot going on – and in this case, it’s a good thing. Instead of more traditional levels, Isbarah‘s gameplay ostensibly consists of one-on-one battles spread out over a few phases. The first phase is something closer to a traditional platformer setup wherein you dodge projectiles and work your way through a maze until you either encounter the boss at either end of the level or activate a set number of nodes through the world. And NOW imagine you can’t leave that little circle or the boss gets stronger! Go get ’em, tiger! The boss fight can then begin in earnest and it’s here we see the meat of Isbarah‘s gameplay. 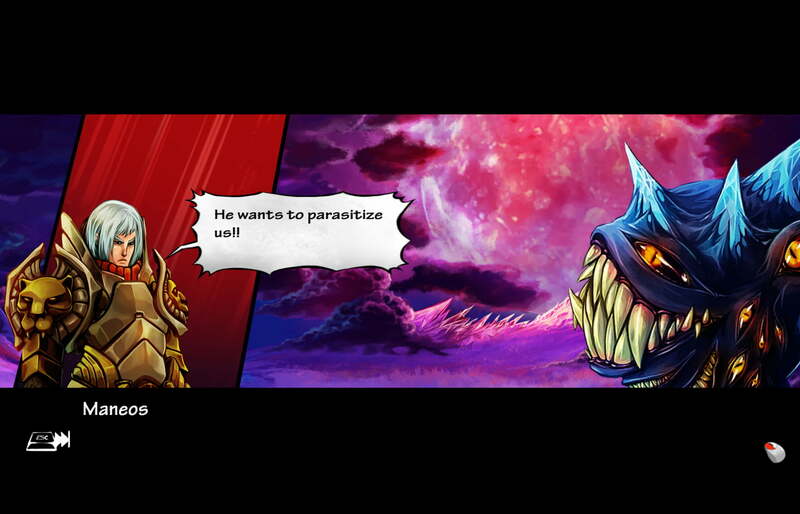 Boss battles come in two forms. The first has you jumping, dashing, and evading all over the level to activate three sporadically-placed rail guns (which require you to keep up with their erratic movement in order to fully charge), each rail gun causing unavoidable damage to the boss until the first half of their health bar is depleted. Doing this enters the second phase of the fight, requiring you to dodge an absurd number of fireballs, magic missiles, and the like until a large circular spell-wheel not dissimilar to the ones found in the Nintendo DS Castlevania titles charges completely, allowing you to damage the boss by either shooting at them (which allows you to stay at a much safer distance) or by striking it with your sword (which is riskier but restores a unit of health if done properly). That may have taken a while to explain, but I promise it makes much more sense in practice and won’t take as long to get used to as you’re probably thinking. What MAY take some getting used to are the unconventional controls. All movement is handled with the mouse and keyboard, which is weird at first but it provides for the sort of precision you need for many of your powers. Along the way you gather a series of powers such as dashing, entering slow-motion, and creating barriers, all of which require the precise targeting of a mouse – a helpful cursor shows you what direction you’ll be dashing in to better avoid enemy attacks, and a swipe of the mouse allows you to draw barriers at any angle to deflect enemy attacks or provide an extra platform off which to jump. Does it all work? Yes, so long as you’re the sort who doesn’t mind trial by fire. Even in the early stages the game demands a careful awareness of your situation and surroundings lest you collide with an errant spike or magic sphere, and the sort of attention it requires frequently doesn’t allow you enough time to really get used to the controls of a new power before demanding you use it to navigate the cramped paths of hazards that make up each arena. But when it does work, it works beautifully, and evokes something close to a 2D version of an acrobatic action title like Devil May Cry or Bayonetta with a heightened focus on evasion over combat. The plot and art is maybe a little too “Western-take-on-anime” at times, but it’s surprisingly well-thought out and fitting overall. Befitting the rather unorthodox way the game proceeds, the plot and graphics take an appropriately otherworldly bent. You play as Iria, a goddess (and the daughter of a suspiciously young white-haired deity simply referred to as “God”) set out to defend a magic realm created by human imagination from a series of abominations known simply as The Designless, beings left unfinished by human’s minds that look like a cross between old Final Fantasy monsters and Hieronymous Bosch paintings, fitting the theme. The graphics evoke the hand-drawn/painted-cel look of Braid with the swirling colors and eerie landscapes, and even if some of the character designs are a bit Avatar: The Last Airbender, they serve the setting very well. Isbarah is absolutely going to be one to look out for if you’re the sort who likes their games with a standout hook. I’m hesitant to say ‘gimmick’ as that makes it sound more like you have one mechanic you use consistently through the entire game (like Bionic Commando or something). One of Isbarah‘s greatest strengths is the way it forces you to learn to combine your powers and adapt to new situations. Sure, if done improperly, the game’s weird reliance on boss fights could prove tedious over the course of a full game to many, but if you’re in need of a new PC platformer that isn’t just “jump-on-head-and-collect-treasure”, then Isbarah‘s weird charms and odd mechanics might sit pretty well with you. I suppose someone’s imagination would look like this, somewhere, but this is all the time I’d really like to spend in it. Just…don’t worry too hard about what hideous beasts your imagination may be creating. Isbarah is a fun mash-up of platformer, action game, and bullet-hell shooter that provides a beautiful art style and rewarding challenge to anyone willing to learn it's occasionally frustrating controls and mechanics. 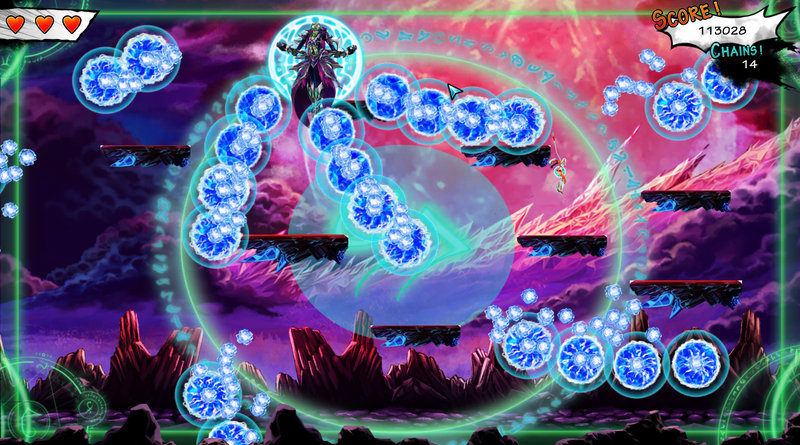 The easily infuriated and/or impatient would want to steer clear, but if you're the sort that isn't immediately put off by hearing the phrase "bullet-hell" you'll find a lot to like here. I'm sorry that rhymed. I love your Sartre reference, Tim. That’s legitimately one of my favorite quotes. Thank you! I was torn between that or “If You Are Going Through Bullet Hell, Keep Going” but I felt it was too long and less appropriate.